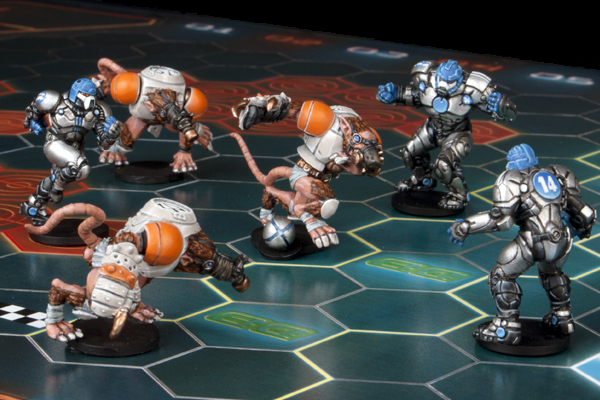 As a huge fan of BattleBall, my jaw dropped when I came across DreadBall on Kickstarter. It's similar to BattleBall in that it's a dice-based futuristic sports game using (very similar looking) miniatures and a hex board, but the gameplay of DreadBall is very different. It's actually a completely made up sport, mixing the aggression of football with the accuracy of bowling (kind of?). Add on some very thematic future rules and you have Dreadball. And you also have my $100. $100 may sound pretty steep, especially when you can pick up BattleBall at a yard sale for about $2, but you get a LOT for your money. Check out this image. You can also get the full game for $80 or go all out and spend as much as you want, adding in all kinds of goodies along the way. The pledge goal was $20,000, which is nothing for a miniatures game. As I was writing this post, it just crossed the $400,000 mark giving all backers at $100 or higher a massive new character named Yorik Yorikson. I'll leave you with one image of the game in action. Warning though. If you head to the Kickstarter page and scroll all the way to the bottom, you will destroy your wallet. There are so many add-ons.